The story of this house started like a dream. 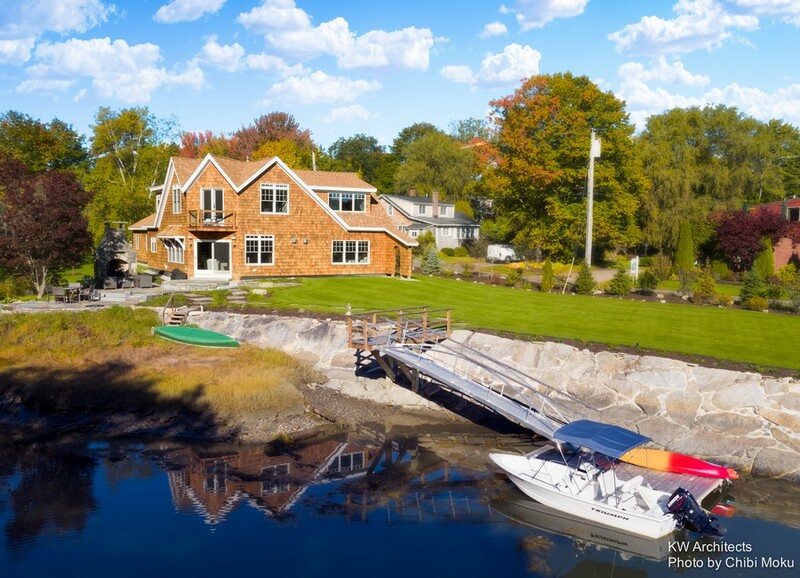 The future masters, Heather and Greg Burke, spent sweet summer on their boat in the Kennebunkport and admired the view of a secluded cottage on the bank of the river. Its location was perfect from all aspects: close to the historic heart of the city and yet hidden away from the prying eyes of tourists, right next to a Franciscan Monastery that has a 65-achre preserve and a short walk to the beach. And what is the most important, right on the bank of a picturesque river. Later it turned out that the house went up for sale, and the Burkes didn’t hesitate to buy it. Initially their plan was to renovate the existing building, but this turned out to be a great challenge. 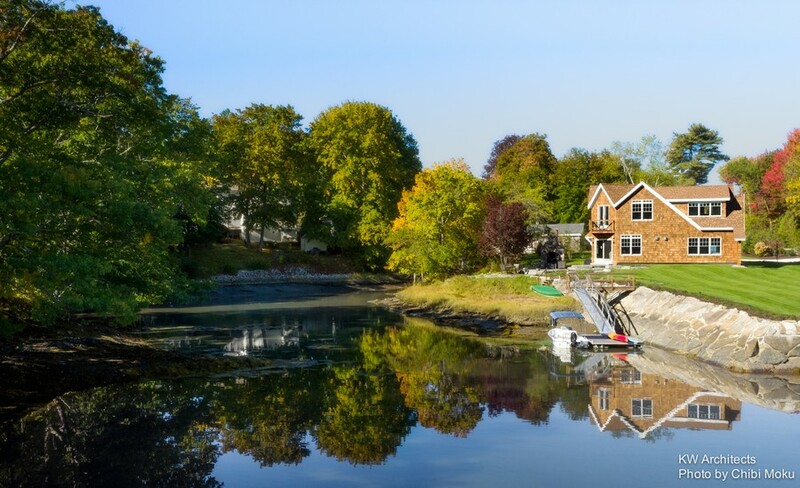 The point is that the Kennebunk River is tidal, with a 10-foot surge every day, and when the tidal waters came up, they would wash under the house’s foundation and then wash back out again. 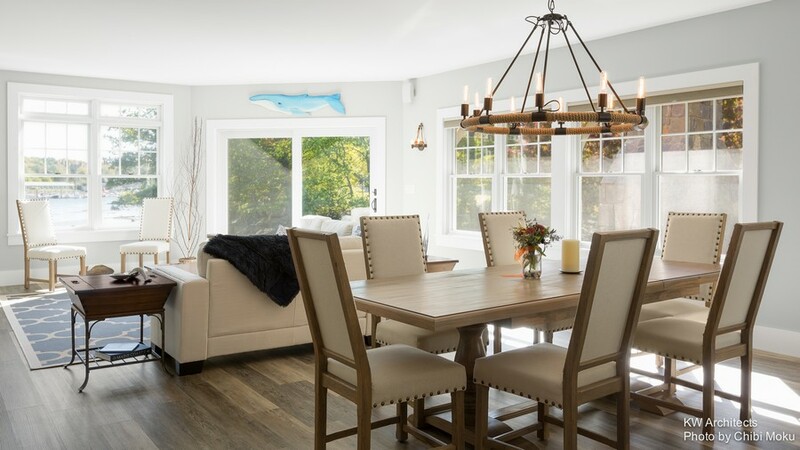 Aware of the rough shape of the building, the new owners decided to start from scratch and hired a professional architect – Kristi Kenney from KW Architects. She was entrusted with a task of creating a house that would preserve the integrity with the river, the landscape in general and with the scale of the neighborhood. Kristi did a really great job: the house was built in a traditional New England Cape Cod style in a lot of ways, but with many interesting architectural flairs. The unique roof lines alone deserve a special mention. The front is facing the street and hence has just a few small strategically placed windows, while the rear part of the house features big windows offering a spectacular view of the river from all the residential rooms. 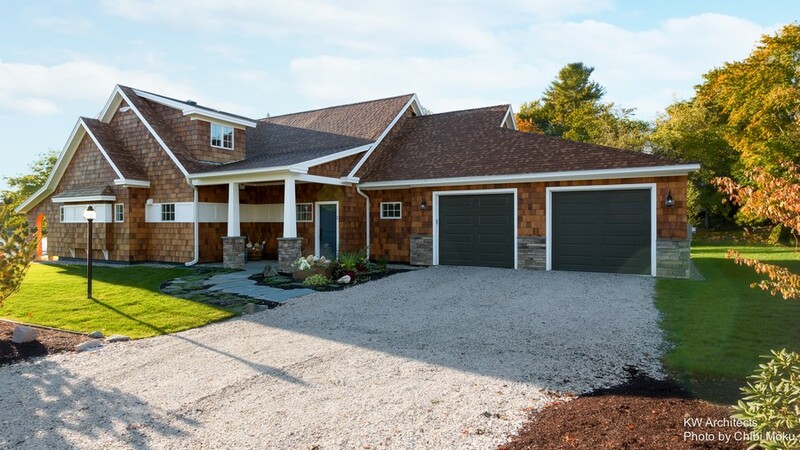 The front is dressed up with a with a few interesting details, such as a traditional New England blue door, a stone with a house number engraved and a seashell driveway reminding of the closeness to the beach. On the river front the architects clipped off the rectangular corner of the building to arrange a beautiful glass door leading to a terraced patio with a fireplace and a port view, which gave the project its name – “Port Watch”. 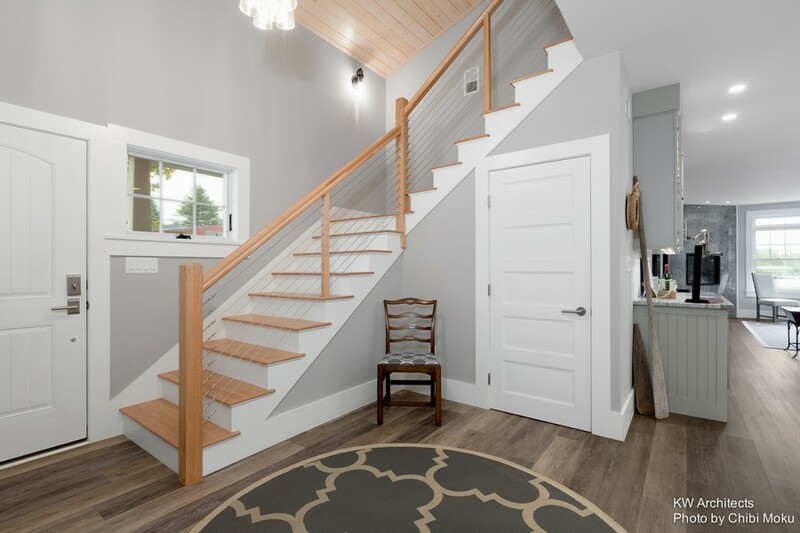 When you walk in the front door, you find yourself in a big hallway with a whitewashed “nickel-gap” wood boarding wall, which continues on the ceiling above the tension wire stair rails. 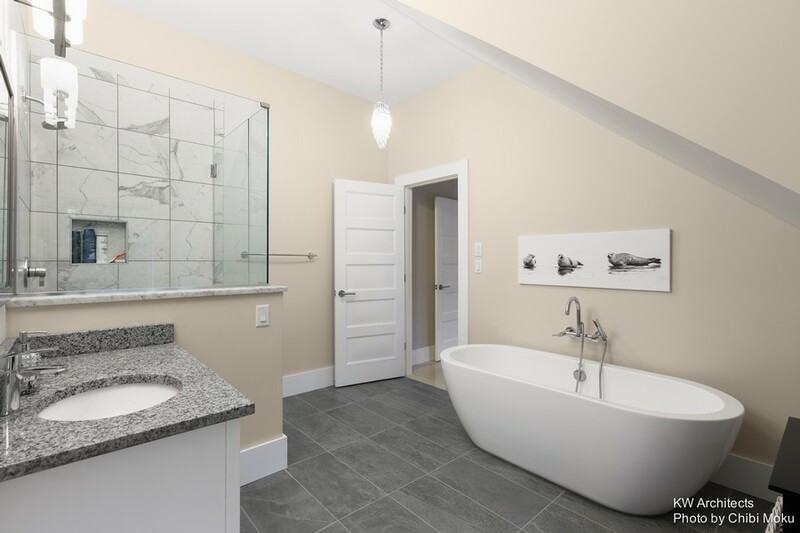 The next room you see is a gorgeous spacious open-concept living room, dining room and kitchen. This is the point when you realize that this house, so traditional and conservative outside, has a very contemporary interior. This is the room with a patio exit and the best river view. 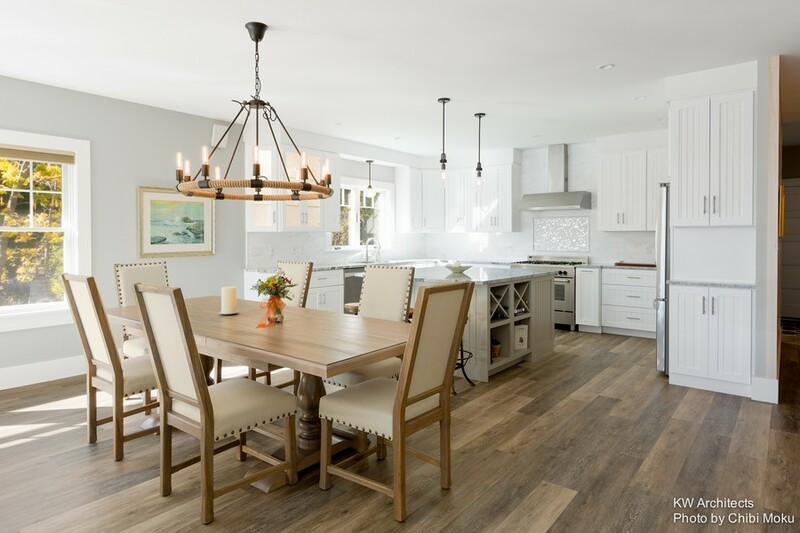 The masters are keen on parties and such a concept of the kitchen with a big island made cooking an activity and perfectly matched their lifestyle. 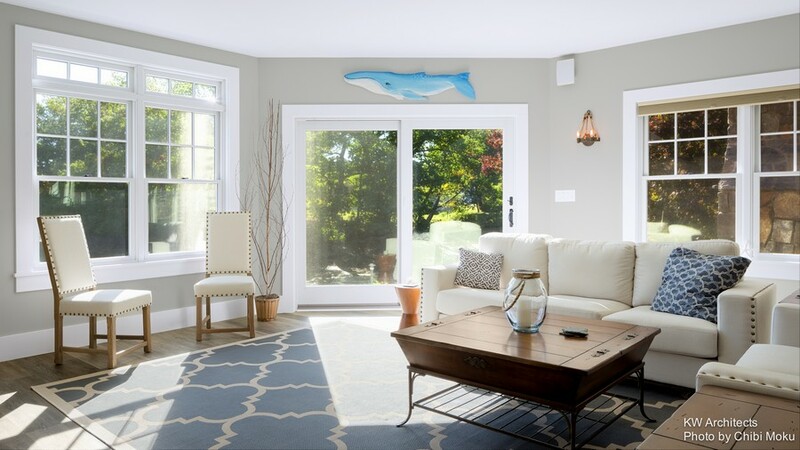 Arranged in beige and gray, with blue accents, this great room may look pretty different: on sunny days it’s light, bright and airy, when the tidal waters surge it features many blue tones of the river, and in the low-tide periods it’s quiet, calm and subdued. 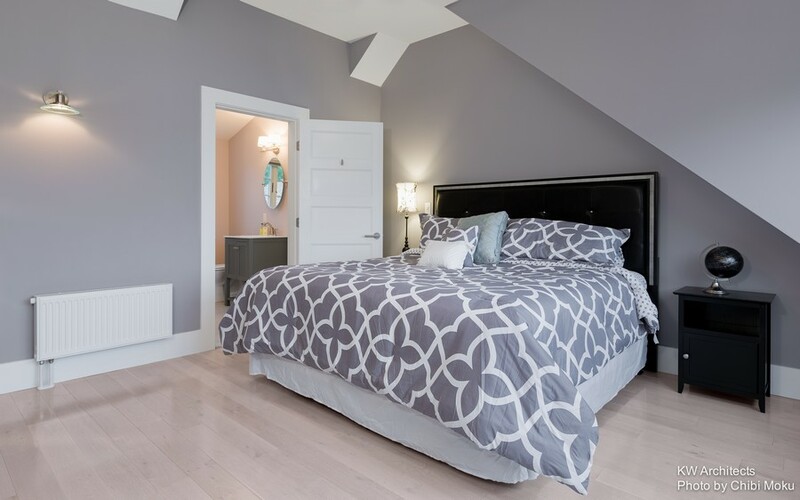 A similar color scheme was applied to the rest of the rooms in the house. By the way, it was the masters who picked all the colors and materials for the interior design. The house includes three big bedrooms and two bathrooms. 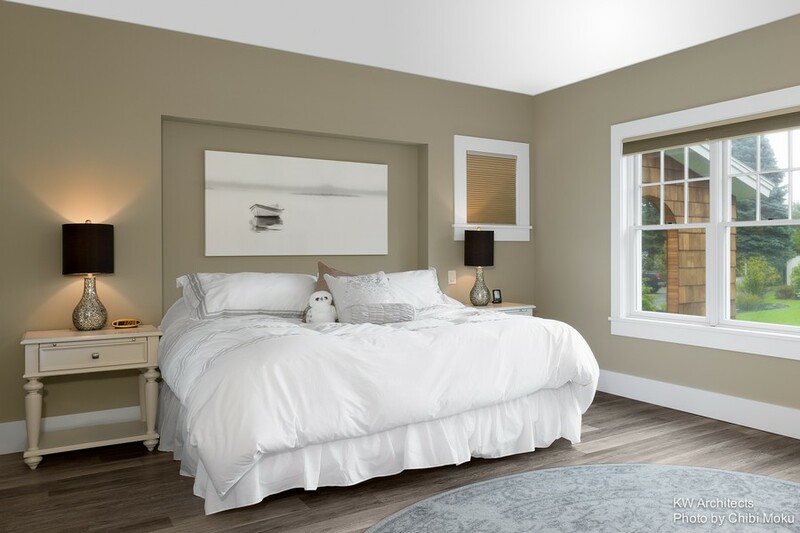 The master bedroom on the first floor is very calm and neutral, designed in white and beige. 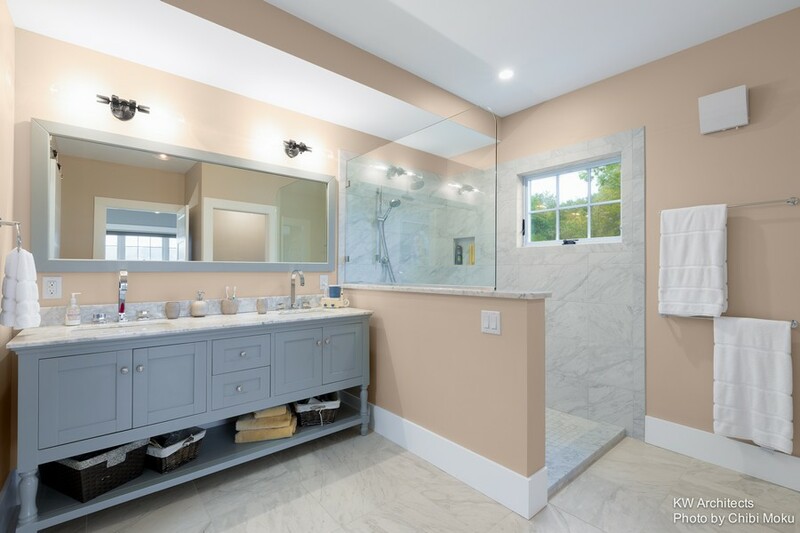 …and the other has a bathroom with a full-fledged walk-in shower and a giant wash basin. Also upstairs you will find an office – the room with the most challenging architecture, according to the authors of the project. 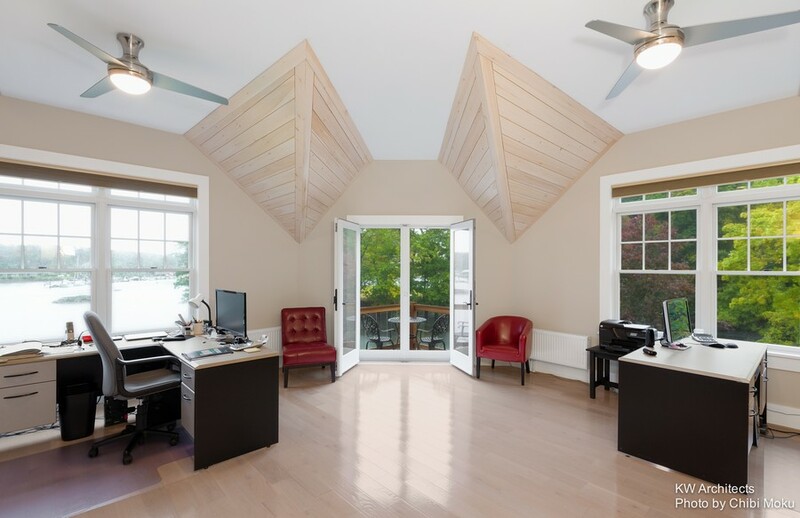 Giant beams, a unique roof shape – putting all these elements together and figuring out the right angles without a loss of the ceiling height was a real challenge. 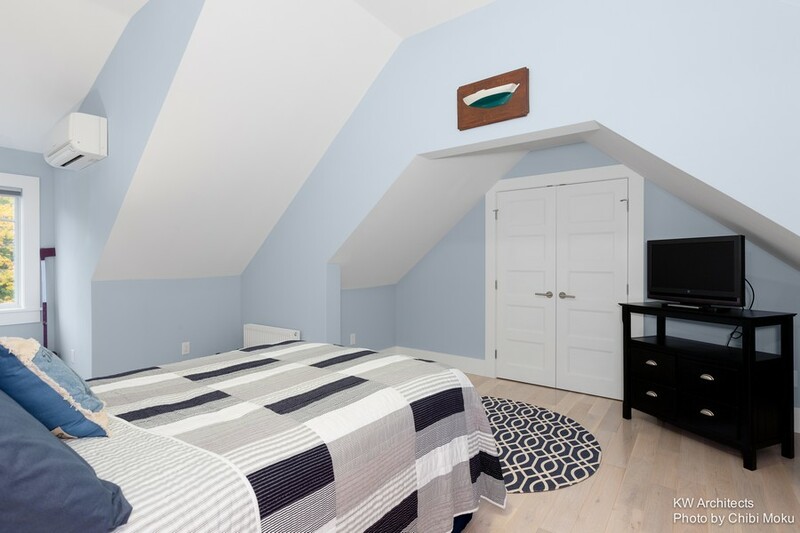 But the guys did a great job and now the ceiling is dressed up with elements of a “ship” that look so organic against the Kennebunk Port background and do not take away the precious volume of the room.